The following panel contains an interactive 3D elevation map of most of Saudi Arabia. It is intended to help provide geographic context for where the Saudi's are focusing shale gas efforts. To use the map, rotate it using the left mouse button, zoom using the mouse wheel, and control the viewing perspective using the right mouse button. Link to full screen version this rotatable, zoomable 3D oil and gas map of Saudi Arabia. Saudi Arabia is the world's largest holder of crude oil proved reserves and was the largest exporter of total petroleum liquids in 2013. In 2013, Saudi Arabia was the world's second-largest petroleum liquids producer behind the United States and was the world's second-largest crude oil producer behind Russia. 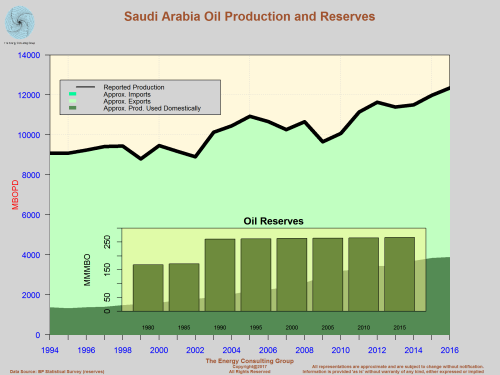 Saudi Arabia's economy remains heavily dependent on petroleum. Petroleum exports accounted for 85% of total Saudi export revenues in 2013, according to the Organization of the Petroleum Exporting Countries (OPEC)'s Annual Statistical Bulletin 2014. With the largest oil projects nearing completion, Saudi Arabia is expanding its natural gas, refining, petrochemicals, and electric power industries. Saudi Arabia's oil and natural gas operations are dominated by Saudi Aramco, the national oil and gas company and the world's largest oil company in terms of production. Saudi Arabia's Ministry of Petroleum and Mineral Resources and the Supreme Council for Petroleum and Minerals have oversight of the oil and natural gas sector and Saudi Aramco. Saudi Arabia is the largest consumer of petroleum in the Middle East, particularly in the area of transportation fuels and direct crude oil burn for power generation. Domestic consumption growth has been spurred by the economic boom as a result of historically high oil prices and large fuel subsidies. According to the BP Statistical Review of World Energy 2014, Saudi Arabia was the world's 12th largest consumer of total primary energy in 2013 at 9 quadrillion British thermal units (Btu), of which about 60% was petroleum-based, with natural gas accounting for the rest. The King Abdullah City for Atomic and Renewable Energy (K.A. CARE) program seeks to ensure that half2 of the electricity generated in Saudi Arabia comes from renewable sources by 2032, when forecasted electricity demand growth will necessitate power generation capacity to increase to 120 gigawatts (GW). The increased use of renewable sources allows for more oil and natural gas originally allocated for domestic power needs to be freed up for export. In the interim, Saudi Arabia is participating in the Gulf Cooperation Council's efforts to link the power grids of member countries to reduce shortages during peak power periods. More than half of Saudi Arabia's oil reserves are contained in eight fields. The giant Ghawar field, the world's largest oil field with estimated remaining reserves of 75 billion barrels, has more proved oil reserves than all but seven other countries. According to the Oil & Gas Journal (OGJ), Saudi Arabia had approximately 266 billion barrels of proved oil reserves3 (in addition to 2.5 billion barrels in the Saudi-Kuwaiti shared Neutral Zone, half of the total reserves in the Neutral Zone) as of January 1, 2014, amounting to 16% of proved world oil reserves. Although Saudi Arabia has about 100 major oil and gas fields, more than half of its oil reserves are contained in eight fields in the northeast portion of the country.4 The giant Ghawar field is the world's largest oil field in terms of production and total remaining reserves. The Ghawar field has estimated remaining proved oil reserves of 75 billion barrels,5 more than all but seven other countries. Saudi Arabia is the largest oil-consuming nation in the Middle East. Saudi Arabia consumed 2.9 million barrels per day (bbl/d) of oil in 2013, almost double the consumption in 2000, because of strong industrial growth and subsidized prices. Contributing to this growth is rising direct burn of crude oil for power generation, which has reached an average of 0.7 million bbl/d from 2009 to 2013 during the months of June to September, according to the Joint Oil Data Initiative (JODI), and the use of natural gas liquids (NGL) for petrochemical production. The current president and Chief Executive Officer of Saudi Aramco, Khalid al-Falih, said that domestic liquids demand was on pace to reach more than 8 million bbl/d of oil equivalent by 2030 if there were no improvements in energy efficiency. Saudi Arabia produced on average 11.6 million bbl/d of total petroleum liquids in 2013, of which 9.6 million bbl/d6 was crude oil production and 2 million bbl/d was non-crude liquids production. Total petroleum liquids production declined 0.13 million bbl/d from 2012, the first decline since 2009. Saudi Arabia decreased its crude oil production in 2013 to accommodate non-OPEC production growth, mainly from the United States and, to a lesser extent, Canada. Saudi Arabia maintains the world's largest crude oil production capacity, estimated to reach about 12 million bbl/d at the end of 2014, and the country is subject to OPEC production quotas. 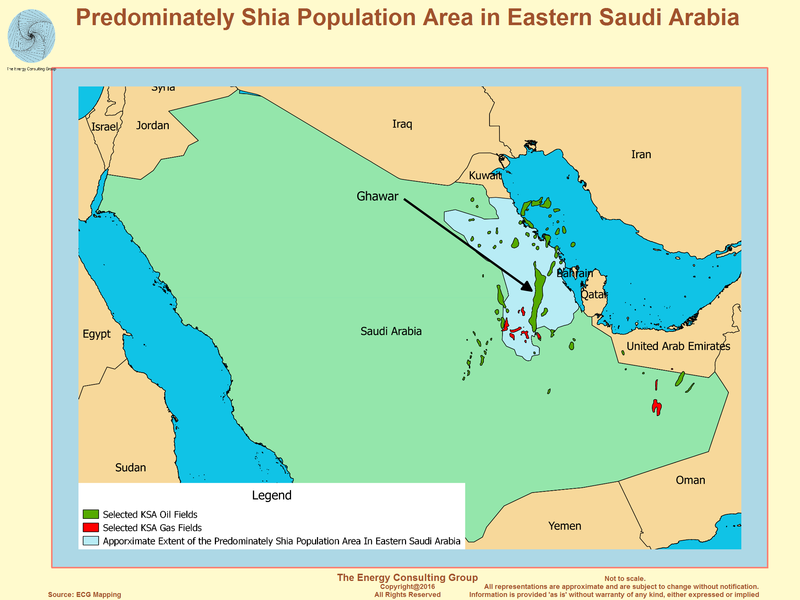 Of this capacity, about 300,000 bbl/d is Saudi Arabia's share of the production in the Neutral Zone. Non-crude liquids, which are not subject to OPEC quotas or production targets, are produced at full capacity. There are currently no plans to increase oil production capacity. Saudi Arabia's long-term goal is to further develop its lighter crude oil potential and maintain current levels of production by offsetting declines in mature fields with newer fields. Saudi Arabia produces a range of crude oils, from heavy to super light. Of Saudi Arabia's total crude oil production capacity, more than 70% is considered light gravity, with the remaining crude oil considered medium or heavy gravity.7 The country is moving to reduce the share of the latter two grades. Lighter grades generally are produced onshore, while medium and heavy grades come mainly from offshore fields. Most Saudi oil production, except for the Extra Light and Super Light crude oil types, is considered sour, containing relatively high levels of sulfur. Saudi Aramco said that its fields do not require the use of enhanced oil recovery techniques, although fields in the Neutral Zone could require steam flooding. The Ministry of Petroleum and Mineral Resources estimates that oil fields in Saudi Arabia have decline rates no higher than 2% per year.8 Saudi Aramco has stated that it will conduct additional drilling at existing fields to help compensate for the natural declines from the mature fields. Khurais onshore 1.2 million bbl/d of Arab Light crude. Plans to expand capacity by 0.30 million bbl/d by 2017. Manifa offshore 0.90 million bbl/d of Arab Heavy crude oil after completion at end of 2014. Production will be used to offset declines in mature fields. Shaybah onshore 0.75 million bbl/d of Arab Extra Light. Plans to expand capacity by 0.25 million bbl/d by 2017. The Saudi-Kuwait Neutral Zone (also called the Divided Zone) is an area of 2,230 square miles between the borders of Saudi Arabia and Kuwait. The Neutral Zone contains an estimated 5 billion barrels of total proved oil reserves that are divided equally between the two countries. Saudi Aramco operates the world's largest oil processing facility and crude stabilization plant in the world at Abqaiq, in eastern Saudi Arabia, with a crude processing capacity of more than 7 million bbl/d. The plant processes the majority of Arab Extra Light and Arab Light crude oils, as well as NGL. The facility's infrastructure includes pumping stations, gas-oil separation plants (GOSPs), hydro-desulphurization units, and an extensive network of pipelines that connects the plant to the ports of Ras al-Ju'aymah, Ras Tanura, and Yanbu (for NGL). According to the Arab Oil and Gas Journal, more than 70% of Saudi crude is processed12 at Abqaiq before export or delivery to refineries. The facility was the target of a terrorist attack in 2006 (see Security Issues Section). According to OGJ, Saudi Arabia has eight domestic refineries, with a combined crude throughput capacity of about 2.5 million bbl/d13 (of which Aramco's share is approximately 1.8 million bbl/d).14 Saudi Arabia continues to integrate its refinery projects with large petrochemicals complexes, in what has been described as the creation of petrochemical cities. Yanbu Aramco Sinopec Refining Company (YASREF) Limited, a joint venture with Chinese Petrochemical Corporation (Sinopec), will be able to process up to 400,000 bbl/d of Arab Heavy crude oil from the planned Manifa oil development by the third quarter of 2014. Saudi Aramco is developing its 400,000 bbl/d Jazan refinery project in southwest Saudi Arabia. It will be able to process Arab Heavy and Arab Medium crude oil by late 2016. Saudi Aramco is studying an expansion of its integrated Petro Rabigh Refinery and petrochemical joint venture, which currently has a capacity of 400,000 bbl/d. Saudi Arabia has also initiated a number of clean fuels projects to provide more ultra-low sulfur diesel fuel. The Yanbu refinery, jointly owned by Saudi Aramco and Mobil Yanbu Refining Company (a subsidiary of ExxonMobil), was upgraded to produce cleaner fuels. Similar upgrades were completed on the Jubail refinery jointly owned by Saudi Aramco and Shell Saudi Arabia Refining. The Saudi petroleum pipeline and export network (and energy sector in general) has been a terrorist target in the past. In February 2006, Saudi security prevented an attempted suicide bomb attack at the Abqaiq petroleum processing facility, after Al-Qaeda leadership called for renewed attacks against the country's economic backbone. Following the 2006 incident, the government increased the National Guard and military security force to approximately 20,000 guards, in addition to the 5,000 guards employed directly by Saudi Aramco. In addition to direct security, Saudi Arabia is known to ensure export security by maintaining redundancy (i.e., multiple options for transportation and export) in its oil system, in part as a form of indirect security against any one facility being disabled. Saudi Arabia is the second-largest petroleum exporter to the United States, after Canada. According to the Global Trade Information Services (GTIS), Saudi Arabia exported an estimated 7.7 million bbl/d of crude oil in 2013. Asia received an estimated 68% of Saudi Arabia's crude oil exports as well as most of its refined petroleum products. Saudi Arabia exported an average of 1.5 million bbl/d of total petroleum liquids to the United States in the first quarter of 2014, an increase of 0.4 million bbl/d from the first quarter of 2013. Since 2012, Saudi Arabia has been the second-largest petroleum exporter annually, after Canada, to the United States. In 2013, after the United States, the next four top importers of Saudi crude and petroleum products according to GTIS were Japan (1.2 million bbl/d), China (1.1 million bbl/d), South Korea (0.9 million bbl/d), and India (0.8 million bbl/d). The port of Ras Tanura on the Persian Gulf has an average handling capacity of 3.4 million bbl/d,16 and it handles most of Saudi Arabia's exports. The Ras al-Ju'aymah facility on the Persian Gulf has an average handling capacity of about 3 million bbl/d,17 and because of the availability of various Single Point Mooring buoys, the largest oil tankers can be accommodated for crude loadings. In addition to these primary export terminals, Saudi Arabia has other smaller ports including Ras al-Khafji, Jubail, and Jeddah. A 236-mile multi-products line between Dhahran in the Eastern Province and Riyadh and a smaller 220-mile multi-products line between Riyadh and Qassim to the north were also built in the 1980s. Saudi Aramco does not operate any major functioning international pipelines. The Trans-Arabian Pipeline (Tapline), built in 1947 to transport crude oil from Qaisumah through Jordon to Sidon, Lebanon, has been closed, in part, since 1984. The portion of the pipeline that runs to Jordan was closed in 1990. Saudi Arabia's only functioning international crude pipeline system is a 60-year old complex of four small underwater pipelines carrying Arabian Light crude from Saudi Arabia's Abu Safah field to Bahrain.20 This aging pipeline system is expected to be decommissioned after the construction of a new pipeline with a capacity of 350,000 running between Abqaiq and Bahrain's refinery at Sitra. The new pipeline is expected to be completed in the third quarter of 2016. Saudi Aramco's shipping subsidiary, Vela International Marine Ltd., operates 15 Very Large Crude Carriers (VLCCs) that transport crude between the Middle East, Europe, and the U.S. Gulf Coast. Vela also operates five product tankers conducting coastal trade in the Red Sea and the Persian Gulf. Vela has a large number of VLCCs and product tankers employed on time or as spot charters. In addition to tankers, Saudi Aramco owns or leases oil storage facilities around the world, including Rotterdam (3.9 million barrels),23 Sidi Kerir (the Sumed pipeline terminal on Egypt's Mediterranean coast), and Japan (6.3 million barrels),24 according to the Middle East Economic Survey. The National Shipping Company of Saudi Arabia (also known as Bahri) is a public company that owns and operates a modern fleet of 17 VLCCs, 24 chemical tankers, and other cargo ships. The Public Investment Fund (PIF) of the Saudi Arabian government holds 28% of the company's shares, while the remaining 72% are publicly traded shares held by the people of Saudi Arabia. Saudi Aramco determines the official selling price (OSP) of its crude oil based on the location of the consumer and the quality of crude that is shipped. The OSP is calculated by adding a differential to a specific crude oil benchmark price. For crude oil exported to Asia, the OSP is based on the average of Dubai and Oman crude prices published by the pricing agency Platts. Crude oil exported to Europe and the Mediterranean has an OSP based on the Brent Weighted Average (BWAVE) published by Intercontinental Exchange. Crude oil exported to North America has an OSP based on the Argus Sour Crude Index (ASCI), which provides an average daily assessment on the price per barrel of a basket of medium sour crudes from the U.S. Gulf Coast including the Mars, Southern Green Canyon, and Poseidon crude streams. Saudi Arabia used West Texas Intermediate (WTI) crude oil price as the benchmark prior to 2010, but the country switched to the ASCI in part because the ASCI is viewed as being more representative of the U.S. Gulf Coast sour crude market. Saudi Arabia has the world's fifth-largest natural gas reserves, but natural gas production remains limited. 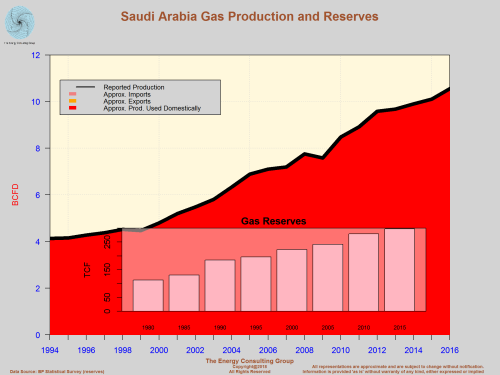 Saudi Arabia (including the Neutral Zone) had proved natural gas reserves of 291 trillion cubic feet (Tcf)26 as of January 1, 2014, fifth largest in the world behind Russia, Iran, Qatar, and the United States, according to OGJ. The majority of natural gas fields in Saudi Arabia are associated with petroleum deposits, or are found in the same wells as the crude oil, and production increases of this type of gas remain linked to an increase in oil production. Rapid reserve development is necessary for Saudi Arabia's plans to fuel the growth of the petrochemical sector, as well as for power generation and for water desalination. All current and future gas supplies (except NGLs) reportedly remain earmarked for domestic use, in part to minimize the use of crude oil for power generation. However, natural gas production remains limited, as soaring costs of production, exploration, processing, and distribution of natural gas have squeezed supply. The National Oceanic and Atmospheric Administration (NOAA) and the World Bank Global Gas Flaring Reduction partnership estimate that in 2011, Saudi Arabia lost 131 Bcf of gas production to flaring. Although most of its natural gas reserves are from associated gas, Saudi Arabia is unlikely to boost its gas production from associated gas reserves in the near future because the country has completed its recent major oil development phase, and it has shifted its attention to natural gas and downstream petroleum activities. Saudi Aramco has focused heavily on major offshore gas developments in the Persian Gulf. Exploration and development will also commence in non-producing areas such as the Red Sea, northern and western Saudi Arabia, and the Nafud basin, north of Riyadh. 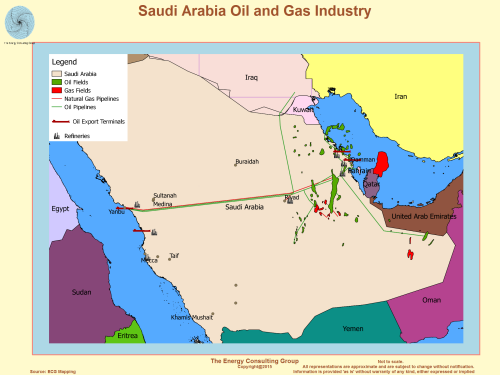 Saudi Aramco divides its exploration activities into three regions: the northwest portion of the country, the South Ghawar region, and the Rub al-Khali desert in the southern portion of the country.30 Saudi Aramco also launched its Upstream Unconventional Gas program in 2011 to access Saudi Arabia's unconventional gas resources. In its 2013 Annual Review, Saudi Aramco discussed the development of a 1,000 megawatt (MW) power plant that will use shale gas for power generation. The Saudi domestic natural gas market, traditionally the sole domain of Saudi Aramco, is slowly being opened to private investment both in exploration and distribution, and to increasing competition in the market. The key component of the non-associated gas exploration strategy relies on foreign consortiums exploring for onshore gas and condensate in the Rub al-Khali, referred to as the Empty Quarter in English, which encompasses most of the southern third of Saudi Arabia. South Rub al-Khali Company, or SRAK (a venture of Saudi Aramco and Royal Dutch Shell). In 2014, Shell ended its exploration of the Empty Quarter. Sino Saudi Gas Limited (a venture of Saudi Aramco and Sinopec). As of July 2014, these ventures did not make significant commercial discoveries, in part because development costs would be far higher than Saudi Arabia's official domestic natural gas price. Domestic demand for natural gas, particularly the delivery feedstock to petrochemical plants, has driven continued expansion of the Master Gas System (MGS), the domestic gas distribution network in Saudi Arabia first built in 1975. Prior to the MGS, all of Saudi Arabia's natural gas output was flared. The MGS feeds gas to the industrial cities including Yanbu on the Red Sea and Jubail. Saudi Arabia plans to increase electricity generating capacity to 120 gigawatts (GW) by 2032 to meet the country's rapidly growing demand for electricity. SEC is the largest provider of electricity in the Saudi Arabia, with total available generating capacity of 58 GW.43 The state-owned Saline Water Conversion Corporation (SWCC), which provides most of the Saudi Arabia's desalinated water, is the second-largest generator of electricity. SWCC plans to rapidly increase its desalination capacity, with an equivalent increase in generation capacity. Privately-owned independent water and power plants also provide electricity to the grid. Saudi Aramco continues to build cogeneration plants to generate power for its own needs at various oil facilities. Saudi Arabia is moving to create a more competitive power market through a series of physical and regulatory changes. In 2013, the Electricity and Cogeneration Regulatory Authority (ECRA) allowed Saudi Aramco to sell any excess electricity it produced through the intermediary of SEC, according to the Arab Oil and Gas Journal.44 According to ECRA, Saudi Arabia has to invest about $140 billion through 2020 to increase SEC generating capacity to 71 GW and to satisfy increasing electricity demand.45 In 2014, ECRA hired HSBC Holdings to explore splitting SEC into four separate power generation companies, in an attempt to privatize the electricity market. Physical improvements will also be needed to allow more companies to sell power to the grid. SEC has ongoing and planned projects that will link power plants in the eastern, western, and southern portions of the country together. In order to meet peak demand requirements, Saudi Arabia is participating in the Gulf Cooperation Council's efforts to link the power grids of member countries. The Gulf Cooperation Council is composed of six countries. Saudi Arabia has also discussed a 3 GW cable link with Egypt, whose peak electricity demand hours vary from those of Saudi Arabia. The power link is estimated to cost $1.6 billion and bidding for the project is expected to begin in 2015.46 Expansions to the power grid will allow Saudi Arabia to improve access to back up power generation from renewable sources. Data presented in the text are the most recent available as of September 10, 2014. 1Internal estimate from U.S. Energy Information Administration. 2King Abdullah City for Atomic and Renewable Energy, "Energy Sustainability for Future Generations" (accessed August 2014), http://www.kacare.gov.sa/en/?page_id=84. 3Oil & Gas Journal, "Worldwide look at reserves and production" (January 1, 2014). 4Arab Oil and Gas Directory, "Saudi Arabia" (2013), page 383. 5Internal estimate from U.S. Energy Information Administration. 6Internal estimate from U.S. Energy Information Administration. 7Facts Global Energy, "Middle East Oil Databook" (April 2014). 8Arab Oil and Gas Directory, "Saudi Arabia" (2013), page 385. 9Arab Oil and Gas Journal, "Saudi Arabia/Kuwait" (February 16, 2014), page 37. 10Arab Oil and Gas Journal, "Saudi Arabia/Kuwait" (February 16, 2014), page 37. 11Middle East Economic Survey, "Cost Blow-Out For NZ Steam Injection Project" (February 14, 2014), page 3. 12Arab Oil and Gas Journal, "Saudi Arabia" (September 16, 2013), page 24. 13Oil & Gas Journal, "Worldwide Refining Capacity Detail" (January 1, 2014). 14Saudi Aramco, "Annual Review 2013" page 33. 15Middle East Economic Survey, "Aramco In $100Bn Downstream Push, At Home and Abroad" (May 30, 2014), page 8. 16Internal estimate from U.S. Department of Energy. 17Internal estimate from U.S. Department of Energy. 18Internal estimate from U.S. Department of Energy. 19Internal estimate from U.S. Department of Energy. 20Internal estimate from U.S. Department of Energy. 21Internal estimate from U.S. Department of Energy. 22Pipeline Magazine, "Bahrain's Bapco exports record crude in 2013" (accessed June 2014), http://www.pipelineme.com/news/regional-news/2014/02/bahrains-bapco-exports-record-crude-in-2013/. 23Middle East Economic Survey, "Saudi Arabia Increases Asian Focus With Japan Oil Storage Deal" (February 21, 2014), page 14. 24Middle East Economic Survey, "Saudi Arabia Increases Asian Focus With Japan Oil Storage Deal" (February 21, 2014), page 14. 25Journal of Commerce, "99% of Shareholders Present Voted for Bahri-Vela Merger" (accessed June 2014), http://www.joc.com/maritime-news/international-freight-shipping/99-shareholders-present-voted-bahri%E2%80%93vela-merger_20140626.html. 26Oil & Gas Journal, "Worldwide look at reserves and production" (January 1, 2014). 27Arab Oil and Gas Directory, "Saudi Arabia" (2013), page 404. 28Pricing assessment at United Kingdom National Balancing Point (NBP) natural gas market. 30Arab Oil and Gas Journal, "Saudi Arabia" (April 1, 2014), page 12. 31Saudi Aramco, "Karan Gas Program" (accessed August 2014), http://www.saudiaramco.com/en/home/expertise/worlds-leading-supplier-of-energy/gas-development/karan-gas-program.html. 32Arab Oil and Gas Journal, "Saudi Arabia" (October 16, 2013), page 32. 33Arab Oil and Gas Journal, "Saudi Arabia" (October 16, 2013), page 33. 34Middle East Economic Survey, "Saudi Arabia Stems Domestic Oil Demand Growth" (August 23, 2013),Â page 2. 35Middle East Economic Survey, "Saudi Direct Crude Burn Plan Can Only Work Short-Term, Says FGE" (April 25, 2014), page 11. 36Reuters, "Saudi, Kuwait shelve Dorra gas field project" (accessed July 2014),Â http://www.reuters.com/article/2013/08/29/kuwait-saudi-dorra-idUSL6N0GU16520130829. 37Lukoil, "Saudi Arabia" (August 2013), https://lukoil-overseas.com/projects/saudovskaya-araviya. 38Arabian Oil and Gas, "Eni and Repsol come up empty at Rub Al Khali" (accessed June 2014), http://www.arabianoilandgas.com/article-9874-eni-and-repsol-come-up-empty-at-rub-al-khali/. 39Arab Oil and Gas Directory, "Saudi Arabia" (2013), page 386. 40Middle East Economic Survey, "KACARE Outlines Saudi Electricity Energy Source Scenario" (May 3, 2013), page 7. 41Middle East Economic Survey, "Saudi Arabia In Power Generation Efficiency Drive" (April 4, 2014), page 8. 42Middle East Economic Survey, "KACARE Outlines Saudi Electricity Energy Source Scenario" (May 3, 2013), page 7. 43Saudi Electricity Company, "Annual Report 2013" page 5. 44Arab Oil and Gas Journal, "Saudi Arabia" (April 16, 2013), page 26. 45Arab Oil and Gas Journal, "Saudi Arabia" (May 1, 2014), page 33.